I don’t know if the American politician Donald Rumsfeld has ever been quoted in a MusicWeb International review. However, his name came to mind when I asked to review this Pentatone SACD. That’s because there were a number of “Known knowns” associated with this release but also a very definite “Unknown unknown”. In the former category came the South Dakota Chorale whose previous release, Sacred Songs of Life and Love had strongly impressed me (review). Also well known to me was the artistry of organist Christopher Jacobson, whose recital on the organ of Duke University Chapel I’d much admired, as had Dan Morgan (review). The sonic excellence of Pentatone recordings is something I’ve experienced on many occasions. However, Marcel Tyberg (pronounced ‘Tee-berg’) and his music were completely “Unknown unknowns” as far as I was concerned. Once the disc arrived, however, I began to find out more and I learned that two of his three symphonies have been recorded by JoAnn Falletta and the Buffalo Philharmonic, each symphony coupled with a substantial chamber work. I’ve not yet heard either of those discs but the Second Symphony and Piano Sonata No 2 were reviewed here by Rob Maynard while William Hedley reviewed the coupling of the Piano Trio and the Third Symphony; the latter was Tyberg’s last completed work. A brief biographical sketch of Tyberg may be appropriate for the benefit of readers who, like me, come freshly to his life and music. For this I draw on the useful booklet notes, He was born in Vienna to parents who were highly accomplished musicians themselves. The family became close to the family of the violinist Jan Kubelik and as a result young Marcel forged a friendship that was to endure until his death with the son of Jan Kubelik, the conductor Rafael Kubelik. It seems that little is known of Marcel’s education but eventually the family moved to the Adriatic resort town of Abbazia. There Marcel appeared from time to time as a soloist and conductor with the local symphony orchestra, composed and earned a living as a music teacher and church organist. After his father died in 1927 Marcel and his mother remained in Abbazia and although it doesn’t appear that Tyberg enjoyed great prosperity or celebrity his friend Rafael Kubelik premiered his Second Symphony (1931) with the Czech Philharmonic, no less, during the 1930s. Tyberg was, apparently, a devout Roman Catholic but his mother had a Jewish great-grandfather. This was sufficient to get the Tybergs into difficulties when the Nazis took over what is now Croatia, including Abbazia, in 1943. Not long after Tyberg’s mother passed away he was arrested by the Germans in 1944 and transported to Auschwitz-Birkenau where he died at the end of 1944. I was moved to read in William Hedley’s review of the Third Symphony that Tyberg’s father was born in the Polish town of Oswiecim where in 1940 the Auschwitz concentration camp was established; it could fairly be said that Marcel Tyberg’s life described a tragic circle. If the story of Tyberg’s life is sad then the story of the survival of his music is truly remarkable. Just before he was arrested – surely knowing that was likely to happen – he entrusted his manuscripts to a family friend, Dr Milan Mihich. The doctor and his family made their way to the USA after the war and though Dr Mihich died in 1948 his son, Enrico, who had been a harmony student of Tyberg, preserved the music. Enrico Mihich’s primary focus was on pursuing a distinguished medical career, which took him to the city of Buffalo in New York State. Nonetheless, he made efforts to get Tyberg’s music recognised and performed, lobbying several conductors of the Buffalo Philharmonic. Eventually, he received a sympathetic hearing from JoAnn Falletta and Tyberg’s music has been performed and several major works have been recorded, as mentioned above. Tyberg’s legacy includes three symphonies, a string sextet, a piano trio, two piano sonatas and a number of songs. So far as I’m aware the two Masses here recorded are his only surviving choral works – a setting of the Te Deum, first performed in 1943, is now lost. The Masses are scored for mixed chorus and organ. There are limited opportunities for soloists – in these performances the solos are sung by members of the choir. It’s not clear from the notes whether these compositions were designed for liturgical or concert use but I’m pretty certain that Tyberg intended them to be sung as part of the liturgy. Though I haven’t seen any scores the choral writing is never showy and I would judge that the music lies within the scope of a well-trained amateur choir. In saying that I mean no disrespect to the South Dakota Chorale whose singing is consistently polished and highly accomplished. The earlier Mass, in G major, is the more substantial of the two. The Kyrie opens with majestic organ and choral writing. 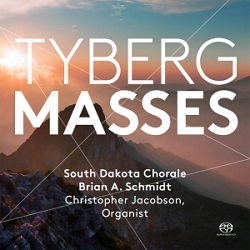 For the most part the choral music is homophonic though Tyberg eventually expands into polyphony as the movement winds down to a tranquil close. The Gloria has a sturdy, confident opening. At ‘Domine Deus’ the music becomes slow-moving and reverent until ‘Quoniam tu solus sanctus’, at which point a vigorous, well-sprung fugue takes us through to the movement’s end. The Credo is substantial, commencing with a strong and energetic proclamation of faith. A reflective organ passage leads to ‘Et incarnatus est’ where Tyberg’s tone is simple and humble. The ‘Crucifixus’ is dark and pensive, after which news of the Resurrection is powerfully voiced by the choir and organ. Here the music is full of majesty and it sounds absolutely splendid in this performance. The treatment of ‘Et in Spiritum Sanctum’ is quite individual: Tyberg contemplates the mystery of the Holy Spirit in a contemplative fashion. The music bursts into fugal life at ‘Et unam sanctam catholicam’. In this extended episode the fugal writing is accomplished and interesting and it leads to a very firm ‘Amen’. This is an impressive setting of the Creed. The Sanctus is gentle and tranquil but the music starts to expand in volume and intensity at ‘Pleni sunt caeli’. There’s genuine grandeur at the ‘Hosanna’, something which is emphasised by the full-throated performance. The movement concludes with a tranquil organ postlude which leads without a break into the Benedictus. Here the music is beautiful and luminous and for the first time a solo voice is heard in the form of a brief tenor solo. In contrast to what has gone before, the ‘Hosanna’, though short in duration, is fervent. Another soloist, a soprano, is heard at the start of the Agnus Dei. Her heartfelt music is eventually taken up by the choir. This movement, the next to longest after the Credo, is deeply felt and brings the work to a moving conclusion. The F major Mass is smaller in scale. It’s a tightly organised composition and pretty succinct – the Gloria, for example, takes less than three minutes. The Kyrie opens with a big, imposing organ solo, which sounds magnificent here. Though the style of the music is completely different I was put in mind of the thrilling opening of Vierne’s Messe solenelle. However, unlike the Vierne Mass, when the choir eventually enters, singing the same material, their entry is surprisingly restrained. But, then, perhaps I shouldn’t have been surprised: Vierne wrote his Mass for a great Parisian church while Tyberg, I think, had less lofty ambitions for his setting. The Gloria is, as I said, succinct and it’s also very positive in tone. Soloists from within the choir are deployed at ‘Qui tollis’. The Credo is less than half the length of the comparable movement in the G major Mass. Two related factors lie behind the concision, I believe. One is that Tyberg completely eschews any repetition of words and secondly there’s no concluding fugue. The music is robust even when it’s reflective in tone. This seems to me to be a Creed setting of no little conviction. The Sanctus is quite restrained until the soaring ‘Hosanna’, after which there’s a potent and noble organ postlude. In the Benedictus four solo voices intertwine very effectively over the simplest of accompaniments: a very soft, sustained organ chord. The ‘Hosanna’ is set for the choir but even this is subdued. Finally, the Agnus Dei is reflective and touching. These are two fine, well-composed and effective settings of the Mass. They sit very firmly in a lineage that stretches back through Bruckner and Rheinberger to Schubert. There is no mistaking the fact that the music sounds conservative. The more I’ve listened to this music the more firmly I’m convinced that these Mases were firmly intended for liturgical use and that their composer, though he exhibits fine technique in his writing, was determined not to put the Masses out of reach of decent church choirs and organists. I will freely confess that when I first played this disc I thought the music was rather too conservative but I would implore listeners not to dismiss it if they feel that way after a first hearing. Having listened to these Masses several times I believe that the conservatism is constructively intended and that, in any case, the sincerity of the music outweighs any adverse connotations of conservatism. I don’t know if these scores have been published – I’ve not been unable to establish that. If they are not yet in the public domain then I hope they will soon be published so that choirs can investigate them for liturgical or concert use. These works could scarcely have received more distinguished first recordings. The singing of the South Dakota Chorale is absolutely first rate and their performances are full of conviction. It’s evident from a note in the booklet that Brian A Schmidt believes in the music and it’s just as clear that he’s instilled that belief into his singers. Christopher Jacobson plays the crucial organ parts with great distinction; the organ is never less than a telling presence even when played softly. I expected the recording itself to be excellent because it’s engineered by Soundmirror and released by Pentatone. I wasn’t disappointed. The SACD sound has great presence and clarity and the engineers have balanced the choir and organ against each other expertly. Finally, the notes are very good. Tyberg’s voice was cruelly silenced by the Nazis. Now, thanks to the perseverance of the Mihich family and the dedication of the people associated with this disc and previous recordings his voice can be heard again. My colleague Dan Morgan was loud in his praises of this release and made it a Recording of the Month. I can do no more than second his enthusiasm and that of Dominy Clements. Now I must get hold of those Naxos recordings to continue my exploration of Tyberg’s music.